Is it possible that your teeth have a biological effect on other parts of your body? In order to understand this concept, let’s consider the therapeutic effects of Chinese acupuncture. Chinese acupuncture believes there is a universal life energy called Chi (also spelled “Qi”) present in every living creature. This energy is said to circulate throughout the body along specific pathways that are called meridians. As long as this energy flows freely throughout the meridians one’s health is maintained. However, once the flow of energy is blocked, the system is disrupted and pain or illness will occur. Imagine rivers that flood and cause disasters or an electrical grid short-circuiting that causes blackouts. Acupuncture works to “re-program” and restore normal functions by stimulating certain points on the meridians in order to free up the Chi energy. How does this theory apply to dentistry? Years ago, I was first introduced to the Tooth/Organ chart which lists each tooth in the mouth and describes its relationship to other major organ systems in the body. I must admit that I was a bit skeptical when this information was first presented to me. However, after years of observations, clinical experience, and patient testimonials, it’s quite apparent that our teeth are connected to these energetic pathways called meridians and the relationship to other body parts is quite real. If a tooth is compromised by infection or contains a high galvanic current, an imbalanced condition will develop and the natural flow of energy is blocked. 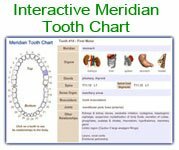 When this occurs, any organ system connected to the tooth’s meridian pathway can be affected in a negative way and eventually diminish your overall health and wellness. Biological dentistry teaches us how to address these dental problems by eliminating the imbalances and restoring or “re-programming” the oral cavity back to its balanced energetic condition. Changes in systemic conditions, e.g. digestive problems, joint pains, fatigue, headaches, sinus infections and even heart palpitations, can correct themselves after correcting the dental concerns. It continues to amaze me how often I witness the positive results that dental interventions have on the rest of the body. In the last 10 years, I’ve recorded hundreds of testimonials that support this theory of energetic pathways and meridians. Two accounts are listed below. Let us not forget, holistic health care includes the entire body and the oral cavity should always be part of a complete medical evaluation. Education is the key ingredient for your continued success with biological dentistry. Application of this information can provide major breakthroughs for patients searching for the missing link to improve their health.